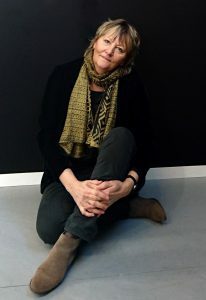 Art teacher, she graduated from ENSET, leads a parallel artist life and has been exhibiting her art since 1975. In 1990, she found in paper the medium that allowed her to fully express herself through immense collages, and then through paper mâché to achieve a new goal : turn this ordinary medium into bewildering sculptures giving the perfect illusion of metal, reminiscent of bronze or copper. With her “Gigantes”, immense necklaces, brooches, earrings to hang on the wall or great rings to set on a piece of furniture, Françoise Jeannin questions dimensions, the out of scale and offers us to treat our interiors with ethnical or baroque yet poetical and refined ornaments.